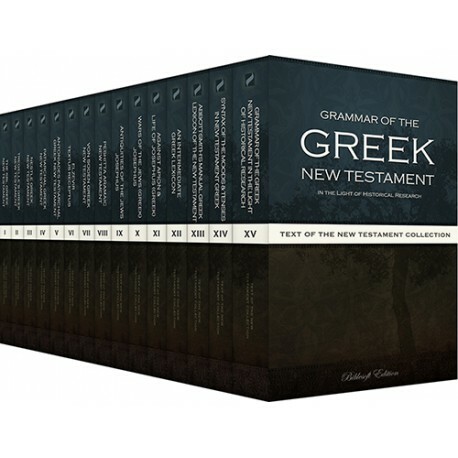 An incredible bundle of New Testament texts including Interlinears, Aramaic and Greek texts, Lexicons and Grammars in 15 works. An incredible bundle of New Testament texts including Interlinears, Aramaic and Greek texts, Lexicons and Grammers in 15 works. The Society of Biblical Literature, in keeping with its mission to foster biblical scholarship, is pleased to sponsor, in association with Lexham Press, a new, critically edited edition of the Greek New Testament. The Greek New Testament: SBL Edition (SBLGNT), which is freely available in electronic form, will be useful to students, teachers, translators, and scholars in a wide variety of settings and contexts. Tregelles's Greek text belonged to the first generation of critical texts that departed from the Textus Receptus as printed in the previous 350 years. Tregelles produced a critical text with a complete apparatus for the whole of the New Testament, a one-man effort only repeated by Tischendorf. Tregelles emphasized the most ancient evidence. Variants are noted which are often not mentioned in the modern pocket editions. Tregelles produced his Greek New Testament in the conviction that theology should follow from the text, not vice versa. Tregelles was a major influence on Westcott and Hort. In order to understand where the textual criticism of the New Testament is at the moment, it is of crucial importance to know how we arrived at this point. The principles Tregelles laid down, and the result of these principles (alongside the evidence he provides for and against his choice of text), are part of the history of the discipline and form an important contribution to that discipline. Tregelles can arguably be described as a theologically conservative scholar. There is a sense in which this conservatism shines through in his method. Tregelles had come to the conclusion that any speculation and reliance on a constructed history of transmission was a dangerous thing to do, but that the only sure ground for establishing the text of the New Testament was to limit oneself to what can be seen in the manuscripts as surviving artefacts. Tregelles combined this notion with his conviction that theology should follow from the text, and that therefore he stood under an obligation to print the text established to the best of his abilities. This title is also available separately for free. The 1904 Edition of Nestle's Greek New Testament. The Nestle Greek New Testament has the historical importance of being the first Greek New Testament edition to replace the Textus Receptus as the most widely printed edition for translators and exegetes. Includes in an Interlinear with Parsings and Strongs. This is the is the authorized 1904 text of the Ecumenical Patriarchate of Constantinople. The Patriarchal Greek New Testament was published by the Patriarchal Press of the Ecumenical Patriarchate of Constantinople in 1904. The Patriarchate of Constantinople assembled a committee of scholars for the purposes of studying various manuscripts of the NT at both Constantinople and Mount Athos. Their goal was to provide "the best reconstruction of the most ancient text of ecclesiastical tradition and, more specifically, of the Church of Constantinople" (from the preface to the 1904 text). The manuscripts they selected were from the ninth to the sixteenth centuries, and were largely from lectionaries (that is, from texts that were actually used in the worship of the Church). Includes in an Interlinear with Parsings and Strongs. Textus Receptus is Latin meaning "Received Text". It comes from the preface to the second edition of a Greek New Testament published by the brothers Elzevir in 1633. In this preface the Elzevirs wrote, Textum ergo habes, nunc ab omnibus receptum: in quo nihil immutatum aut corruptum damus -- “What you have here, is the text which is now received by all, in which we give nothing changed or corrupted.” From this statement comes the term Textus Receptus or TR, which today is commonly applied to all editions of the printed Greek NT. Includes in an Interlinear with Parsings and Strongs. Hermann von Soden’s Die Schriften des Neuen Testaments, originally published in four volumes, is an important contribution to the study and history of the New Testament text. Von Soden introduced a new theory of classifying manuscripts, thus making his critical edition of the Greek text a essential tool for the student of the New Testament. This is the classical Aramaic, or Syriac (cursive), New Testament. Though most scolars accept that the New Testament was written in Greek, some people (and a few churches) believe that Aramaic was actually the original language of the New Testament. Antiquities of the Jews, also Judean Antiquities is a twenty-volume historiographical work composed by the Jewish historian Flavius Josephus in the thirteenth year of the reign of Roman emperor Flavius Domitian which was around AD 93 or 94. Flavius Josephus's Books of the History of the Jewish War against the Romans was written by Josephus, a Jewish historian of the 1st century. It is a description of Jewish history from the capture of Jerusalem by the Seleucid ruler Antiochus IV Epiphanes in 164 BC to the fall and destruction of Jerusalem in the First Jewish Roman War in 70 AD. The book was written about 75 AD, originally in Josephus's "paternal tongue", probably Aramaic, though this version has not survived. It was later translated into Greek, probably under the supervision of Josephus himself. Josephus, soldier, statesman, historian, was a Jew born at Jerusalem about 37 CE. A man of high descent, he early became learned in Jewish law and Greek literature and was a Pharisee. After pleading in Rome the cause of some Jewish priests he returned to Jerusalem and in 66 tried to prevent revolt against Rome, managing for the Jews the affairs of Galilee. In the troubles which followed he made his peace with Vespasian. Present at the siege of Jerusalem by Titus, he received favours from these two as emperors and from Domitian and assumed their family name Flavius. An Intermediate Greek Lexicon is an abridgment of Liddell and Scott’s Greek-English Lexicon the world’s most comprehensive and authoritative dictionary of ancient Greek. Also known as the "Middle Liddell", this work covers essential vocabulary for the most commonly read ancient Greek literature. It also provides help with irregular forms and citations to illustrate the history of Greek usage. Abbot-Smith’s A Manual Lexicon of the New Testament was written to offer an update to older lexicons written based on a Hebrew variant of classical Greek. It was also written to be a quick reference guide for students of the New Testament to use while reading their Greek text. Classified according to its intent, this belongs among the aids to the interpretation of the New Testament. It is designed to assist English-speaking students in the task of translating the Greek New Testament into English forms of thought and expression. The work has not been undertaken under the impression that grammar is an end in itself, or that a knowledge of it is the sole qualification for successful interpretation, but in the conviction that grammar is one of the indispensable auxiliaries of interpretation. The book is written, therefore, in the interest not of historical but of exegetical grammar, not of philology as such, but of philology as an auxiliary of interpretation. If it has any value for historical grammar, this is incidental. Its main purpose is to contribute to the interpretation of the New Testament by the exposition of the functions of the verb in New Testament Greek, so far as those functions are expressed by the distinctions of mood and tense. First published in 1914, Archibald Thomas Robertson’s Grammar of Greek New Testament is still the pinnacle of Baptist biblical scholarship. A time-proven resource that is an essential part of any Greek New Testament student's library. The print version is over 1500 pages in length and is one of the most exhaustive descriptions of New Testament Greek ever produced. A.T. Robertson is also the author of the popular Word Pictures in the New Testament.